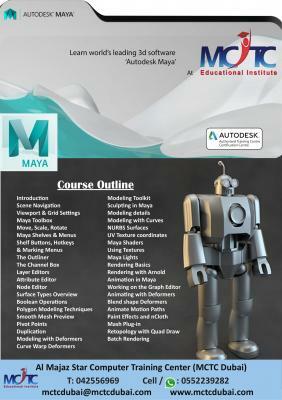 Learn world’s leading 3D software from the expert instructors in Dubai! Enhance your modelling skills to make a bright future. Autodesk Maya is a powerful, integrated 3D modeling, animation, visual effects, and rendering solution software commonly used in film and games industries. Architects, automotive and consumer product designers, and creative advertising professionals also benefit from the unique Maya toolset for exploring, validating, and conveying their designs. Autodesk Maya software offers a robust platform with modeling toolsets that complement the BIM workflow during conceptualization. Architects can also develop their own rules in Maya with the powerful language called Maya Embedded Language (MEL). Enroll with MCTC Dubai, an Autodesk certified and authorized training center in Dubai! #BIM #Revit #architecture #structure #MEP #Navisworks #AutoCAD 2D&3D #StudioMax #Fusion360 #Inventor #Robot #Structural and many more! !